who passed away by natural causes in March 19, 2008 at an age of 81. Sam had a life-long love and relation to the record business. From Doo-Wop in the early 50's to Hip-Hop & Rap in the 90's, he covered it all. Most known he probably became for his Disco releases through his SAM Records. The world will miss another Disco pioneer and we thank him for all the wonderful music and memories he has given us over the years! Sam Weiss started his own SAM Records in Long Island City, New York in 1976. But Sam was no newcomer in the music business; he had actually been in the record industry since the mid 50's together with his brother Hy Weiss. The Weiss brothers were born in Romania in the 1920's, but the family moved to Bronx in New York City when the boys were just a few years old. Hy, who was the older of the two brothers, first got into the record business and became a salesman for popular Rhythm and Blues labels like Apollo, Exclusive, Jubilee and Modern. Hy brought in his brother Sam as he was talented in negotiating and Sam managed to get them the East coast distribution deal for these West coast labels, through their distribution company - Win Records. NY�s first record distribution company. In the late 1940's the Weiss brothers started their first own recording company, called Parody. Things sadly didn't work out and the company was folded. But the guys didn't throw in the towel; in 1954 they were back when they started Old Town Records. Sam was at the time working for a company called the Old Town Paper Corporation on Madison Avenue. The 'Weiss guys' realized that they could use the Paper company's stationary for their correspondence, which would save them money as well as give them a certain credibility with their associates when they would see 'their' posh address. Old Town started out as a Rhythm and Blues label, but over the years they released material in most of the popular genres, everything from Gospel, Jazz and Doo Wop - to Pop, Rock and Soul. All their artists were from around the New York City area with its suburbs and the Old Town acts were frequently played in North-Eastern radio shows. Their most successful act was the Earls. Old Town lived on 'till the mid 1970's and their last releases were by Arthur Prysock. Besides running Old Town, Hy Weiss also headed the promotional department of Stax Records in the late 60's/early 70's. There he worked with Soul and R&B greats as Isaac Hayes and Johnny Taylor. In the mid 70's Disco music started coming on strong and Sam Weiss quickly decided to get on the train and in 1976 SAM Records was born. First release seems to have been the 1976 single "Woman and the Ghetto" by Doris Duke, followed by an act that would score several hits for SAM - namely John Davis & the Monster Orchestra and their Top 5 single "Night and Day". With the Disco music came the DJ culture and also the demand of longer and more 'mixable' versions of the songs and the 12" Disco single was 'accidentally invented' by remixer supreme Tom Moulton. And in 1977 SAM Records started to release their first 12" singles. Actually their first 12" single was Arthur Prysock's "When Love Is New", released on the Weiss Bros Old Town Records, but in the same matrix series as the soon to come SAM 12-inch releases. The Arthur Prysock 12" mentioned above was released in 1976 on matrix OT-12450, while the first SAM Records 12-inch was John Davis & the Monster Orchestra's "I Can't Stop" flipped by "I Get A Kick" which was released in 1977 on matrix number S-12451. 1977 was also the year of the last Old Town release and it was mainly John Davis that was hitting it off for Sam Weiss' new label with the track "Up Jumped The Devil" which peaked at #5 of the Billboard Disco Action Top 40 Chart in February. John Davis' next release peaked at #6 in June of that year, that was the track "the Magic Is You", which surprisingly was released as a 7" single only. In 1978 Lucy Hawkins had a minor hit, but again John Davis and his Monster Orchestra was the ones making all the fuzz. 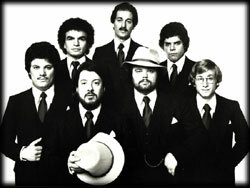 First Mr. Davis recorded a Disco version of the "Kojak Theme" from the very popular TV series, then they returned again with their biggest hit - the classic "Ain't That Enough For You", a track that peaked at #4 in the Billboard Disco charts. The SAM matrix S-12457 is the John Davis & the Monster Orchestra's "Ain't That Enough For You" with "A Bit of the Apple" as the B-side, that's the same as the Columbia 12" single with matrix #23-10887. 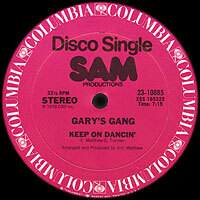 While the SAM matrix S-12458 is the Gary's Gang's "Keep On Dancin'" flipped by "Let's Lovedance Tonight", while the Columbia #23-10885 has got "Keep On Dancin'" on the A-side and "Do It At the Disco" as the B-side. Columbia also released "Let's Lovedance Tonight" on the matrix AS 602 with jazzy and instrumental "Showtime" as the B-side. So, instead of releasing the 12"s on SAM Records, the 12" Disco versions were found on Columbia Records during 1978-1979 but with a 'SAM Production' credit including the SAM logo on the standard Columbia label. It seems to have been the same situation with the 7" singles as well. Under the Columbia Records umbrella John Davis & the Monster Orchestra scored more hits with the songs "Love Magic", "Bourgie bourgie" (a vocal cover of the Ashford & Simpson instrumental classic) and "Baby I've Got It", while Gary's Gang gave us "Let's Lovedance Tonight" and "Do ya wanna go dancin'". There were most likely other SAM Produced artists and songs found on the Columbia imprint, but none that I can recall at this time. One of the first releases was by the group Rhyze and their Funky song "Just How Sweet Is Your Love", which got heavy rotation by Larry Levan at the Paradise Garage, and by other DJ's in other clubs, making it peak at #16 in the Billboard Disco Top 100 charts. Next big hit from SAM was the Leroy Burgess act Convertion's "Let's Do It". Producer Greg Carmichael managed to bring out the best in Leroy's characteristic voice and together they got themselves (and SAM Records) a huge Club hit. Conversion was almost a family thing for Mr. Burgess, besides himself on keyboards and lead & background vocals, the group also included his sister Renee J.J. Burgess and Dorothy Terrell on background vocals, his adopted brother James Calloway played the bass and his cousins Sonny T. Davenport and Willis Long played drums and percussion. In the band were also Sonny DeGraffenreid on guitar, Fred McFarlane on keyboards and Trevor Gale played live drums. Leroy once said the following about the group in an interview; "Sam Weiss owned the copyright of the Conversion name, so when negotiations for continuing the project broke down, Greg and I decided to take the group to another label... Salsoul Records. The first song recorded was "I Know You Will", in a mind numbing nine hour midnight session at Soundworks Studios. Salsoul was most impressed and decided to call in the great Larry Levan to mix. But we needed a new name. As we were busy with other projects, we asked Greg to make up something and get back to us. He decided on Logg (Why - I doubt I'll ever understand). Two weeks later, the single burst onto the radio stations and into the stores. Ken Cayre, President of Salsoul was so impressed, he immediately commissioned six more songs to comprise an album." Convertion actually did return, they released another 12" single on Vanguard Records in 1983 (same year SAM Records folded). The song was the now classic "Sweet Thing", a track Leroy later re-recorded in Stockholm, Sweden in 2001 together with the group Slippery People, credited as Slippery People featuring Leroy Burgess. Other acts the brought success to the label was K.I.D, Vicky D, Komiko, Mike & Brenda Sutton, B.B.C.S. & A. and several others. Even the famous classic female Disco singer Wardell Piper released a song on SAM Records in 1983. In 1981 K.I.D first gave us the #4 hit "Don't Stop" which is a gem with its pumping bass and that 12-inch had the good "Do It Again" as the B-side. They followed it up with the Funky "It's Hot (Take It To The Top)" which had the instrumental underground and early-morning classic "Hupendi Muziki Wangu?! (You Don't Like My music)", both remixed by the FunHouse DJ Jonathan Fearing. "This Beat Is Mine" sung Vicky D in her 1981 hit. This track has become a sought for classic and it's a Soulful Funky-Disco track with Vicki's wonderful vocals added on top - that Beat really IS Vicki's... She returned again in 1982 with the less successful "Mystery Lover". Komiko's wonderful brass-driven Funky stomper "Feel Alright" with its sweet vocals is a personal favorite and the 12-incher came with a Dub version on the flip. Sadly this was the only Komiko release and I would have loved to hear more from them. The Husband-and-wife duo - Mike & Brenda Sutton - hailed from Los Angeles and had earlier been members of the Motown act Finished Touch, which had a hit in 1978 with "Need To Know You Better". On SAM Mike & Brenda released three 12"s, first out was the Soulful "We'll Make It" followed by "Don't Hold Back" and finally the Horns driven Funky "Don't Let Go Of Me" which was also the duo's biggest chart success when it reached number 37 in the Billboard Disco Top 80 in late 1982. "Rock Shock" is an underground Funky Boogie classic from B.B.C.S. & A. and its popularity in certain areas and crowds has got it bootlegged a few times. But in 1983 the SAM Records saga came to an end and the last 12" released was "Somebody's Loving You" by an act named Klassique, that set a nice end to what would become a CLASSIC Disco label. Over the years in business the label got a reputation of putting out quality dance grooves and many DJ's said; If it's on SAM, Just buy it, You won't be disappointed!" John Davis & the Monster Orch. I guess no one got disappointed when SAM all of a sudden revived in 1989/90. The label was back with a new logo, a new matrix series [SAM 5000] and of course new music... The label followed the current trends in music and now it was more HipHop, Rap and Dance, but the label also managed to 'dust off' some old classics and giving them an 'up to date' sound. Their main act at this time was Richard Rogers, but they also made a 1990 remix of Gary's Gang's "Keep On Dancin'" along with "Feel The Love Magic" by John Davis & the Monster Orchestra. That was a remix/remake of the classic "Love Magic". Also Convertion's "Let's Do It" got a Ragga makeover in "Let's Do It in the Dancehall" by Jamal Ski the Bead Master. In 1991 Sam's son, Michael Weiss, took over the Weiss family's legacy in the music business when he started his own Nervous Records. Sam became the Vice-President of Nervous and the SAM Records catalog was brought into the new company. Again a new matrix series was started [SAM-25020] but only a few records were released before everything was released on Nervous. The last SAM release was SAM-25025, Richard Rogers' "All I Want" in 1992. The first CD included 'all' the major hits like Gary's Gang's "Keep On Dancin'" & "Let's Lovedance Tonight", John Davis & The Monster Orchestra's "Ain't That Enough For You" & "I Can't Stop", "Let's Do It" by Convertion, "This Beat Is Mine" - Vicki D and tracks by K.I.D, Rhyze and Mike & Brenda Sutton. Disco Classics - Sam Records Extended Play, Vol. 2 gave us some of the hits and some of the lesser known but yet quality dance grooves. As the CD just starts out with John Davis' version of "Bourgie, Bourgie" and a few tracks in they give us their "Love Magic". In this CD you also find Komiko's "Feel Alright" and K.I.D's "It's Hot! (Take It To The Top)". "Love Either Goes Or Grows" sings Scandal soulfully while Rhyze funk things up in "Do Your Dance". Mike & Brenda Sutton are featured again along with David McPherson and Kreamsicle. Still today [early 2007] Nervous seems to be a little active, even if their web-site seems to have not been updated for quite a while. You can also frequently see Mike's name in panels at various music conferences and I can't understand how he finds time for everything as he's also a practicing New York attorney, besides his job as president for Nervous. So even through good and bad times, Sam Weiss always came back strong and many of the SAM tracks sounds as good today as they did some 25+ years ago. That's probably why many of them have been sampled several times. SAM Records has forever left its footprint in the Disco and music history.